CM: The Stele - Arm of Stavros Diakoumis belongs to a series of sculptures that began in 1998 and continues today. All the works in this series present the artist's concern in relation to the fact that people survive through the conditions of extension, distortion or loss which they undergo either psychologically or corporeally by the general environment - often under the illusion of being sound and complete. According to Diakoumis, in relation to space people act both as receivers and transmitters. The pictures that people receive from their environment are in fact reflections of all the elements that they project upon it. Diakoumis' thought has been indelibly impressed by the following phrase of Denis Diderot (1713-1784) in his essay entitled Réfutation d'Helvétius (1774): "all happened within us because we are always us and never for a minute our true selves". This excerpt summarizes the climactic moments, when human existence appreciates that nothing can be confined, either entirely or for long. For people to comprehend reality they must accept they comprise only a miniscule part of the universe and they will never have a complete picture, not even of their own selves. They can never be only what they think of themselves. In fact Diakoumis' proposal tests what the beholder perceives as natural representation. He proposes the faith that as we constantly interfere and transform of our environment, we ourselcves undergo constant change. People must accept there is always space for something more, and that the way towards fulfillment is never conclusive. The human mind is not possible to comprehend the 'wholeness' of things. Thus the idol and the truth of all things - pictures and knowledge - remain fragmentary. 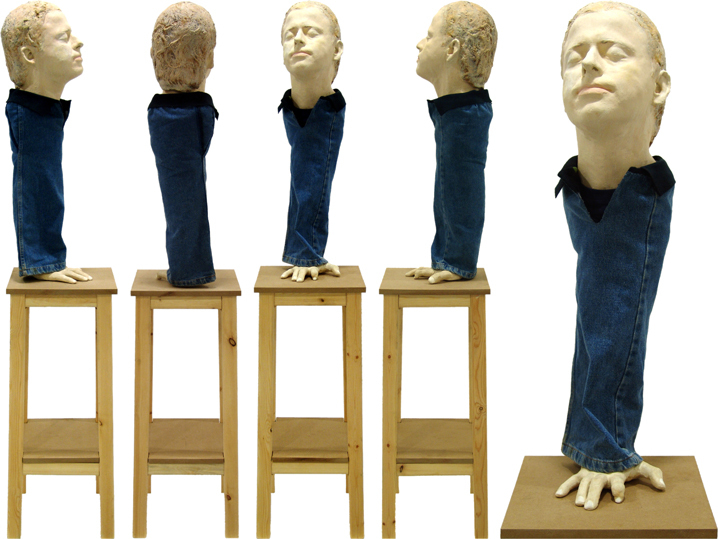 The Stele - Arm presents a self-portrait of the artist comprising of one arm which ends up in a head. According to Diakoumis, this present self-portrait exists independently of things and is full-bodied in a natural way. This artwork is for Diakoumis 'hyperrealistic' with reference not to surrealism but to super realism. As a matter of fact, a typical feature of this particular Stele is the broken finger of the hand's pointer - an autobiographical trait that the artist uses with a feel of derision. In keeping with Diakoumis' artwork, the head has its eyes shut. It sees outwards through the intellectual process known as 'self-knowledge'. In both cases - of shut or open eyes - the relation with reality cannot but be momentary. It would be impossible for people to stand for a long time the weight and the pressure of reality. Of course any encounter with the real is bound to lead to collision. Though the open eyes hurt from the sight, the shut eyes find ways to come to terms with reality.